Dave Sestito originally got into producing unique effects as a result of his daughters love of Korn. That’s right, Korn. As an aspiring young guitarist in 1998, his daughter was in desperate need of a distortion unit to bring her tone into line with those of her favorite bands. Having experience with electronics, Dave launched into creating an effect for his daughter. After that, he started thinking about creating something different and decided to try an echo box. According to an interview by Music Gear Source, Dave spent 8 months hammering away on a design, only to find frustration, eventually tossing the entire unit – literally – into the trash. Not to be undone, Dave returned to the project 5 months later with a new design. One that combined digital power with analog circuitry, producing a warm tone with no noise. That pedal was the Echomaster Delay. It was this pedal and the Ultra Chorus that eventually helped launch DLS Effects. Since starting on this path, Dave has created 6 other pedals such as a Tremolo and a RotoSIM unit. His latest creation is the RotoSPIN and it looks to be a lot of fun. According to the site, the folks at DLS, “turned on the afterburners for the RotoSPIN! This ultra real rotating speaker product offers the right blend of Doppler™, Swirl, Depth, Chew and Grind. 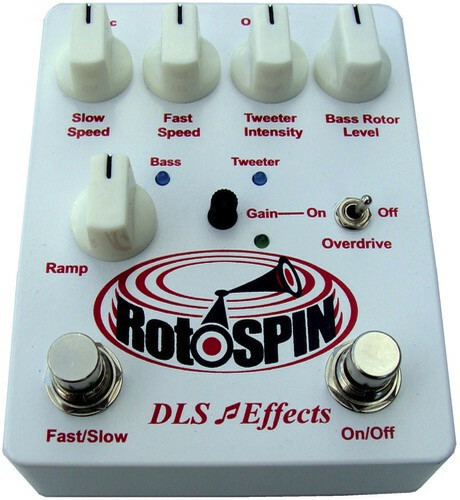 The RotoSPIN allows the musician to dial in multiple Rotary Speaker cabinet sounds and Mic distances using a Tweeter Intensity, Bass Rotor Level, and switchable Overdrive section! It’s features include added control of the tweeter and bass rotor level which allows you to set the emulated microphone distance, the horns intensity levels, the depth of the tone and the amount of Doppler effect you get out of the box. It includes the basic fast and slow knobs to give you flexibility over the whoop-whoop-whoop and whir. This pedal even has an overdrive included for that extra umph. So go ahead and get your Pink Floyd on and check out this pedal from DLS. And, when you get this pedal on your board, make sure you review it for us all at Pedal Finder.